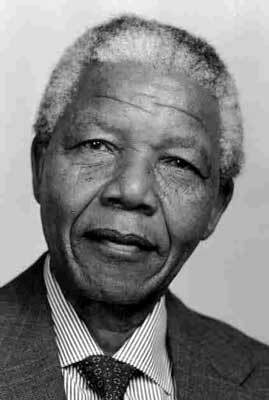 Nelson Mandela, a leader of the ANC, had been arrested in 1964 and sentenced to life imprisonment. Behind bars on Robben Island he became the symbol of the resistance to apartheid. 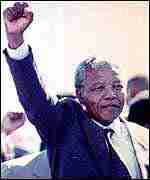 Free Mandela was a familiar cry worldwide. The apartheid system began to fall apart in the 1980s. Two million unemployed blacks, a shrinking white minority, continued black resistance, and an economy suffering from international sanctions finally convinced many South Africans that something had to change. F.W. De Klerk was elected in 1989 and promised to seek a compromise between the majority and the minority. Further, the fall of communism in Eastern Europe in 1989 removed the specter of an ANC supported by the Soviets, which had to many justified the government's oppressive policies. The time was right for change. "Your tireless and heroic sacrifices have made it possible for me to be here ...I place the remaining years of my life in your hands"
Finally in 1990, De Klerk unbanned the ANC and released Nelson Mandela from prison. Mandela had served 28 years. The crowds were jubilant. Mandela worked with De Klerk for a peaceful transition to a multiracial South Africa. 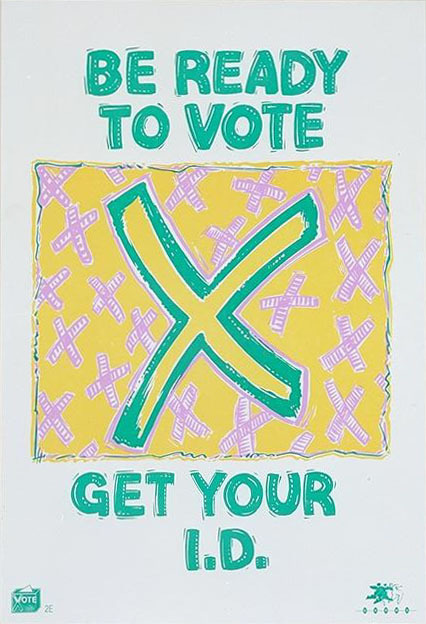 In 1994 the first free multiracial elections were held. Millions of new voters chose from The Afrikaner National Party, the black supremist Inkatha Freedom Party, and the moderate ANC. The ANC received the most votes and Nelson Mandela was elected President by the new Parliament. Apartheid was over. 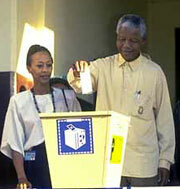 Nelson Mandela casts his vote in the 1994 elections. "Today is a day like no other before it."